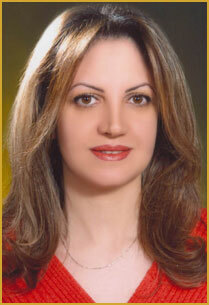 Born in 1966 in the city of Khorramshahr in south Iran, she developed a genuine interest in music as a young student. After completing her education in Laboratory Science in the Medical School of Isfahan University, Ameri started to learn the Persian instrument of Santur. After the completion of her primary music education she entered the Music Faculty of the Honar University in Tehran. During her carrier as a musician and music scholar she has also developed an interest in the theory and history of dance in Iran. For her graduating thesis she presented an article in the field of Iranian dance. She is one of the few dance enthusiasts in Iran who has based her research of Iranian dance theory and history on a few existing and accessible scholar materials on the subject. Azardokht Ameri is currently practicing as a teacher and a professional Santur player. She has been participating in domestic and abroad concerts, recently in Croatia.